Shea Vaughn is a fitness expert, professional trainer, and wellness coach with a lifetime of mind-body experience. Shea has gained national recognition as an inspirational speaker and media personality and is admired by a devoted group of students and clients including athletes and celebrities, helping them all to build strength and flexibility, prevent injuries, "stay in the game," and live more fulfilling lives. She's also the mother of actor Vince Vaughn. Shea Vaughn's written an interesting and well researched book that touches on total body, mind and spirit wellness. Shea shares her own background, and how she started out as a hairdresser, following in her mother's footsteps, but her real love was dancing. Shea had to follow her own dream. And she has done just that. This truly a heart felt life and body wellness program, and I admire that in a self-help book. 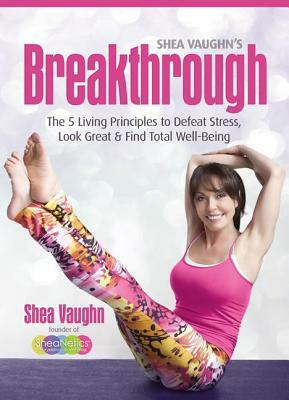 Breakthrough takes you step by step, page by page on a journey with Shea as she sorts through her thoughts on mind - body connections, being in the moment, how we think about ourselves, how we move and how we bring the principles of well being into our lives. Vaughn provides a few recipes for nutrition boosts and also adds in some photos of exercises, stretches and movements that fit into her program for defeating stress and gaining more energy. Ms. Vaughn seems to draw from Eastern and Western ideas on meditation and stress relief in order to gain total body well being. Breakthrough is a chatty and up front self-help book. While the photos are nice, I wish a short DVD had been included in the book. Trying her movements while holding the book or propping it up, just doesn't work too well. I would have liked to have had some sort of video. I know there's a DVD out there, but something with the book would have been nice. All in all, it's a well thought out, nicely written book focused on whole body wellness. I'd give it 3-1/2 out of 5 stars. This book was provided to me by the publicist and that has in no way affected my review.